We have experts on staff who are capable of doing everything from enhancing controls on existing machines to building new controls that monitor and govern every aspect of a special machine's operation. Furthermore, our custom programming experience assures manufacturers that systems requirements will be integrated throughout the design of the special machine. 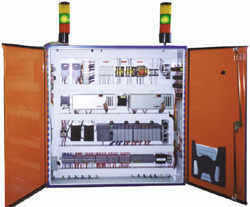 GT can handle simple control panel design, cabinet design, build and wiring or complex software applications.